კარლო გამბინო (იტალ. 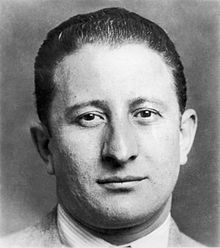 Carlo Gambino; დ. 24 აგვისტო, 1902 — გ. 15 ოქტომბერი, 1976) — ნიუ-იორკის მაფიის ბოსი, წარმოშობით პალერმოდან, (სიცილია). გამბინოს დანაშაულებრივი ოჯახის ბოსი (1957-1976) წლებში. მისი წინაპრების ოჯახი ე. წ. „ღირსეულთა საზოგადოების“ წევრად ითვლებოდა იტალიაში. ბენიტო მუსოლინის მიერ იტალიიდან მაფიოზთა განდევნის შემდეგ, ერთ-ერთი ამერიკელი-იტალიელი, რომელმაც ყველაზე უკეთ ისარგებლა ახალი, კარგად-ორგანიზებული მაფიით სწორედ კარლო გამბინო იყო. საზოგადოებისთვის სამსახურს მისი წევრების დავალებით მკვლელობების განხორციელებით იწყებს 1921 წლიდან, ხოლო 19 წლის ასაკში საზოგადოების „მიღებული წევრი“ გახდა. 1957 წლის აპალაჩის შეხვედრის შემდეგ, როდესაც ნიუ-იორკის შტატის პატარა ქალაქ აპალაჩიში თავი მოიყარა აშშ-ის იტალიური მაფიის ასობით წევრმა, კარლო გამბინო აშშ-ში იმდროისთვის ყველაზე დიდი გავლენის მქონე პირად გადაიქცა. 1937 წელს გამბინო გადასახადების დამალვისთვის დააპატიმრეს, თუმცა მალე საქმეზე ძიება შეწყდა და იგი გაათავისუფლეს. კარლო გამბინო 1976 წლის 15 ოქტომბერს, მასაპეკუაში მდებარე საკუთარ სახლში, 74 წლის ასაკში გულის შეტევით გარდაიცვალა. გამბინოს ოჯახის მემკვიდრედ და ახალ ბოსად კი თავისი ბიძაშვილი პოლ კასტელანო დაასახელა, რამაც შემდგომში ოჯახში დიდი არეულობა და სისხლისღვრა გამოიწვია. Capeci, Jerry; Mustain, Gene (1996) Gotti: Rise and Fall. New York: Onyx. ISBN 0-451-40681-8. Davis, John H. (1993). Mafia Dynasty: The Rise and Fall of the Gambino Crime Family. New York: HarperCollins. ISBN 0-06-109184-7. Bonanno, Joseph (2003). A Man of Honor: The Autobiography of Joseph Bonanno. New York: St. Martin's Press. ISBN 0-312-97923-1. Capeci, Jerry (2002). The Complete Idiot's Guide to the Mafia. Indianapolis: Alpha Books. ISBN 0-02-864225-2. Jacobs, James B.; Panarella, Christopher; Worthington, Jay (1994) Busting the Mob: The United States v. Cosa Nostra. New York: NYU Press. ISBN 0-8147-4230-0.
შეგიძლიათ იხილოთ მედიაფაილები თემაზე „კარლო გამბინო“ ვიკისაწყობში. კარლო გამბინო. Find a Grave. წაკითხვის თარიღი: 14 ივნისი, 2013. Federal Bureau of Investigation - Freedom of Information Privacy Act. Foia.fbi.gov. დაარქივებულია ორიგინალიდან - 2004-08-10. წაკითხვის თარიღი: 2009-03-16. Hundreds at rites for Carlo Gabmbino; Police Snap Photos of the Visitor. The New York Times. წაკითხვის თარიღი: 2009-03-16. Gambino facing loss of his bail; Forfeiture of $100,000 Is Ordered. The New York Times. წაკითხვის თარიღი: 2009-03-16. ↑ “Reputed U.S. crime boss, 74, dies“, Eugene Register-Guard, 16 ოქტომბერი, 1976, გვ. 3A. ↑ “Top organized crime 'Godfather' dies“, Spokesman-Review, 16 ოქტომბერი, 1976, გვ. 1.
ეს გვერდი ბოლოს დარედაქტირდა: 18:36, 23 მარტი 2019.